Martin Brundle is to become BBC Sport's lead Formula 1 commentator in 2011, with David Coulthard moving alongside him as co-commentator. Brundle, who replaces Jonathan Legard, has commentated on 231 grands prix since retiring as an F1 driver in 1996. Brundle said he was "absolutely delighted and very motivated" by his new role alongside Coulthard. The Scot, who joined the BBC after retiring from F1 in 2008, said: "F1 is all about challenging yourself." Ben Gallop, BBC's head of F1, said: "We're always looking for ways to take our F1 coverage to another level - and for 2011 we have an exciting new combination in the commentary box. "We're keen to make the most of Martin Brundle's wealth of broadcasting experience and his popularity with the audience by giving him the role of lead commentator and putting him alongside David Coulthard, one of the biggest names in British motorsport and a skilled race analyst. "We want to tap into their combined on-track expertise - together they will provide our viewers with more immediate discussion, analysis and debate as the action happens." Coulthard, who won 13 grands prix in a 15-year F1 career, added: "This will be a big challenge for me, but one that I am looking forward to. There is a great team on the BBC F1 show and we're looking forward to the year ahead and to bringing something new to our loyal viewers." Brundle has commentated on 231 grands prix since he first joined ITV in 1997 after a 13-year F1 career, during which he drove for Tyrrell, Zakspeed, Williams, Brabham, Ligier, Benetton, McLaren and Jordan. This will be the first time he has been the lead commentator. Brundle and Coulthard have done screen tests in their new roles and Gallop said: "The results of screen tests have been very impressive and we are convinced this combination will deliver a fantastic commentary for our audience for what promises to be a thrilling 2011 season." 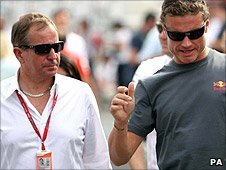 Brundle said: "I'm absolutely delighted and very motivated that BBC Sport has asked me to become the lead Formula 1 commentator alongside David Coulthard. "We have been friends, rivals and colleagues for 18 years and combined we have driven more than 400 F1 grands prix and attended more than 700. "I've never felt more passionate about F1 and I can't wait to get started." Coulthard added: "I'm very excited to be joining forces with Martin in this new role of co-commentator. F1 is all about challenging yourself and this will be a big challenge for me, but one that I am looking forward to. "There is a great team on the BBC F1 show and we're looking forward to the year ahead and to bringing something new to our loyal viewers." The decision to team Brundle with Coulthard means there is no place for Legard in the BBC F1 commentary set-up. Gallop added: "We'd like to take this opportunity to thank Jonathan for his great work over the last two seasons. "He is a first-rate journalist and broadcaster who has been a core member of our team, helping to re-establish BBC Sport as the nation's F1 broadcaster. We wish him all the very best for the future."